Unlike televisions, most computer monitors don’t come with decent speakers built into them, if they come with speakers at all. The sound from a computer monitor often lacks bass and frequently suffers from static or distortion. 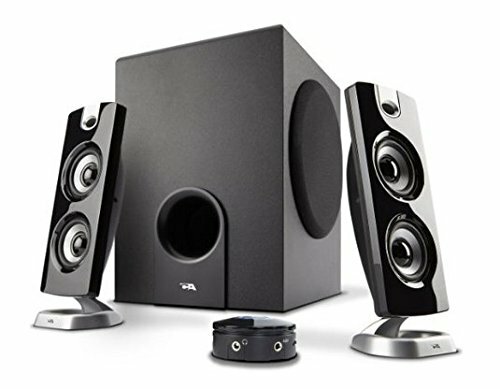 If you’re planning on playing games, listening to music or even watching YouTube videos on your PC, you need a pair of standalone computer speakers. Even if you’re on a tight budget, there is an array of high-quality computer speakers available for $50 or less. Why Choose a Budget Speaker? Even a pair of budget speakers is better than using the default speakers that came with your monitor. While some people may equate a budget price to poor quality, you’ll quickly discover the opposite is true. A pair of budget speakers can still provide a rich, clean sound; they just don’t have all the bells and whistles that you’ll find on the more expensive models. If you’re a true audiophile, a pair of budget speakers is likely not going to be for your discerning tastes. However, for the rest of us, the audio that comes out of a pair of budget speakers is going to be just fine. Now that you know the advantage of buying a pair of budget computer speakers, it’s time to start shopping for your own. On the list below, we’ve highlighted ten of the best computer speakers on the market today, with each pair of speakers coming in at a price of $50 or less. Each of these computer speakers provides excellent audio quality at a price that you’ll love. 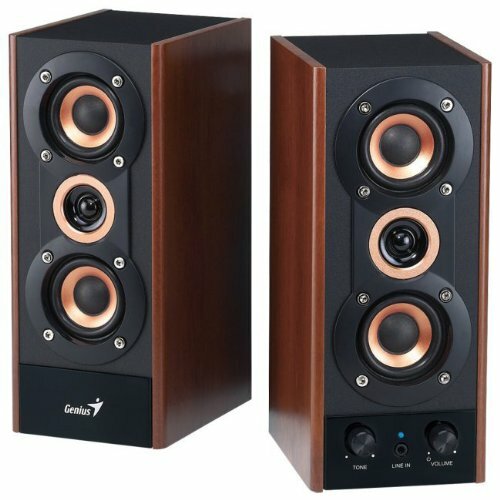 The Satechi ST-WDS20 Dual Sonic Conical v2.0 Computer Speakers don’t look like your average set of speakers. 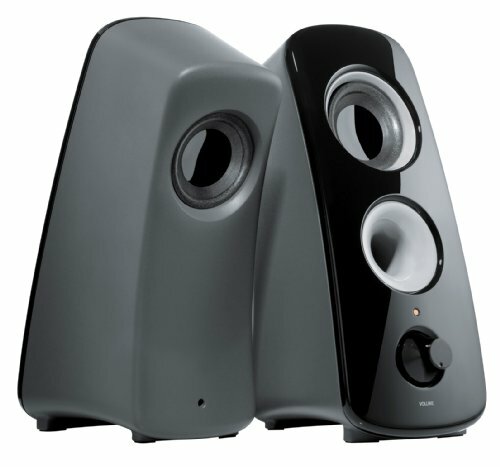 Instead of a rectangular frame, the Satechi ST-WDS20 Dual Sonic Conical v2.0 Computer Speakers sport a circular structure. However, this circular look allows them to deliver a crystal-clear stereo sound that will fill even the largest room in your house. These USB-powered speakers don’t need any drivers to operate; once you plug them into your PC, they begin working immediately. The in-line volume control means that adjusting the sound is always within your grasp while the matte finish will help protect these speakers against scratches. 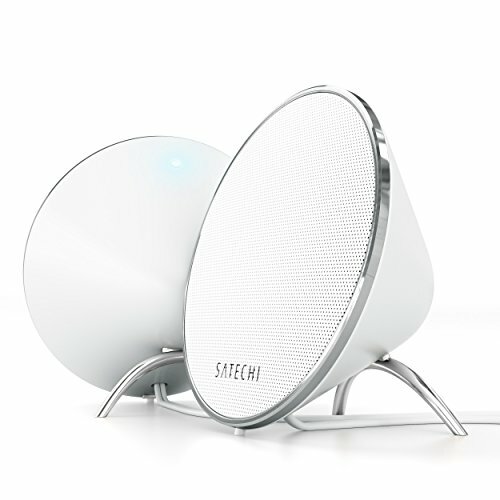 In addition to PCs, the Satechi ST-WDS20 Dual Sonic Conical v2.0 Computer Speakers also work with your Mac and smartphone. 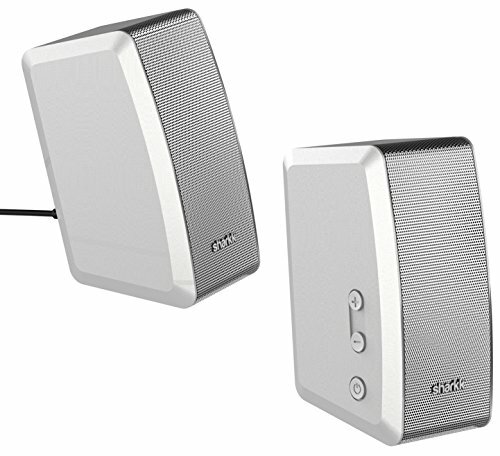 When most computer users think of a pair of budget speakers, they think of something that looks similar to the SHARKK DUO 20W Speaker Set Surround Sound Computer Speakers. However, despite its classic look, the SHARKK DUO 20W Speaker Set packs a number of modern features inside of them. 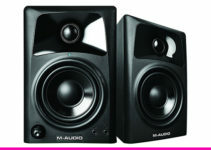 In addition to digital sound processing technology, these speakers also have a digital amplifier to provide rich tones. The dual radial symmetry technology replicates bass sounds without the need for a subwoofer. The included remote control lets you control the volume on these speakers even when you’re not sitting at your computer desk. If you’re looking for a high-quality set of budget computer speakers for gaming purposes, then look no further than the Cyber Acoustics 2.1 Computer Speaker with Subwoofer. 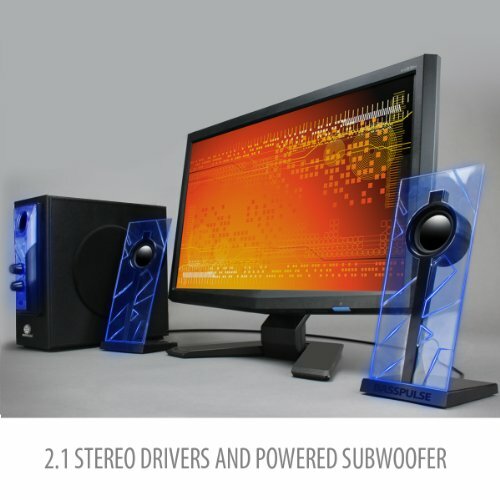 The Cyber Acoustics 2.1 Computer Speaker with Subwoofer is a three-piece stereo system that includes two 30-watt speakers and a powerful subwoofer. The subwoofer is in a wood cabinet to ensure that you get nothing but the deepest bass tones at all times. 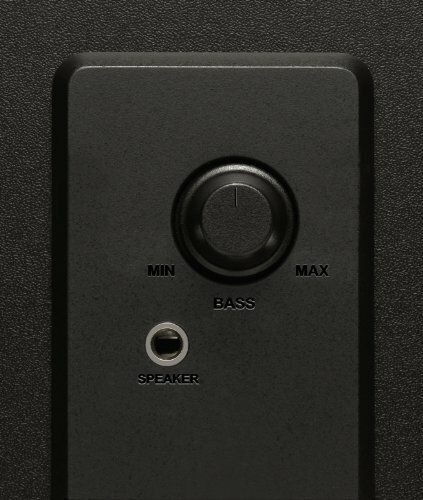 Unlike other budget speakers, the Cyber Acoustics 2.1 Computer Speaker with Subwoofer places the controls on a control pod instead of on the speaker itself. This control pod offers users the ability to activate and deactivate the speakers, raise or lower the volume of the speakers and subwoofer and even gives you a convenient location to insert your headphones into. Logitech is one of the leading names when it comes to speakers, and the Logitech Z313 Speaker System is proof of why fans around the world love this brand. The Logitech Z313 Speaker System provides a huge sound that will fill the room thanks to the compact subwoofer. With the Logitech Z313 Speaker System, you’ll hear and feel every explosion on the battlefield! Setting up the Logitech Z313 Speaker System will take just a few minutes even if this is your first time setting up a pair of computer speakers. The Logitech Z313 Speaker System doesn’t require any additional downloads or drivers to use in Windows, making setup even easier. If you’re low on desk space but still want a high-quality sound, then you’ll love the ELEGIANT USB Powered Sound Bar for Computer Desktop. Instead of a pair of computer speakers, the ELEGIANT USB Powered Sound Bar for Computer Desktop is just one long bar that easily stores under a monitor. 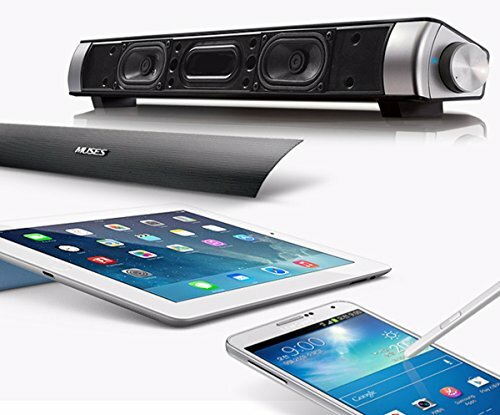 You don’t need to worry about wires or batteries, as the ELEGIANT USB Powered Sound Bar for Computer Desktop is a USB-powered device. Just plug the ELEGIANT USB Powered Sound Bar for Computer Desktop into any available outlet on your desktop or laptop, and you’re ready to bask in crystal-clear sound. The Genius Hi-Fi Wood Speaker for Computers combines a classic look with modern technology. These wood speakers provide a unique sound that you can’t replicate with just plastic. Directly on the Genius Hi-Fi Wood Speaker for Computers is a volume knob, a headphone jack and a line-in jack, putting everything you need right at your fingertips. If you want to experience music from the ’60s and ’70s on your PC the way it was meant to be listened to, then you’ll want the Genius Hi-Fi Wood Speaker for Computers. The Logitech Speaker System Z323 with Subwoofer provides a 360-degree sound that will fill a room of any size. The subwoofer on the Logitech Speaker System Z323 with Subwoofer is a down-firing model that will shake your walls with its deep bass, making this set of budget speakers perfect for both action movies and games. In addition to your computer, the Logitech Speaker System Z323 with Subwoofer also includes inputs that enable you to hook these speakers up to your smartphone or gaming console. For those times when you want to listen to music without waking up the rest of the house, you can plug a pair of headphones into the integrated headphone jack. If you’re looking for a visually unique pair of budget computer speakers, then you’ll love the GOgroove BassPULSE Computer Speaker System. The GOgroove BassPULSE Computer Speaker System uses blue LED accent lights on the speakers that pulse to the beat of the music. Even the look of these speakers is different from the competition; instead of rectangular or circular shapes, the GOgroove BassPULSE Computer Speaker System looks like something out of a science fiction movie. The GOgroove BassPULSE Computer Speaker System doesn’t just look good, but they sound good as well. 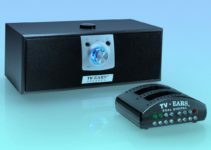 The side-firing subwoofer and full-range satellite speakers will provide you with a crystal-clear sound that you just can’t from the speakers built into your computer monitor. The Logitech Multimedia Speakers Z213 is one of Logitech’s best set of budget computer speakers under $50. The stereo sound comes through clearly on the Logitech Multimedia Speakers Z213, and the subwoofer delivers a deep, pulsating bass that you’ll feel down to your bones. The speakers on the Logitech Multimedia Speakers Z213 are very compact, which is perfect for those who don’t have a lot of room on their computer desk. Creative is known for their high-quality line of sounds cards; however, many consumers don’t realize that the company also puts out a high-quality line of computer speakers as well. 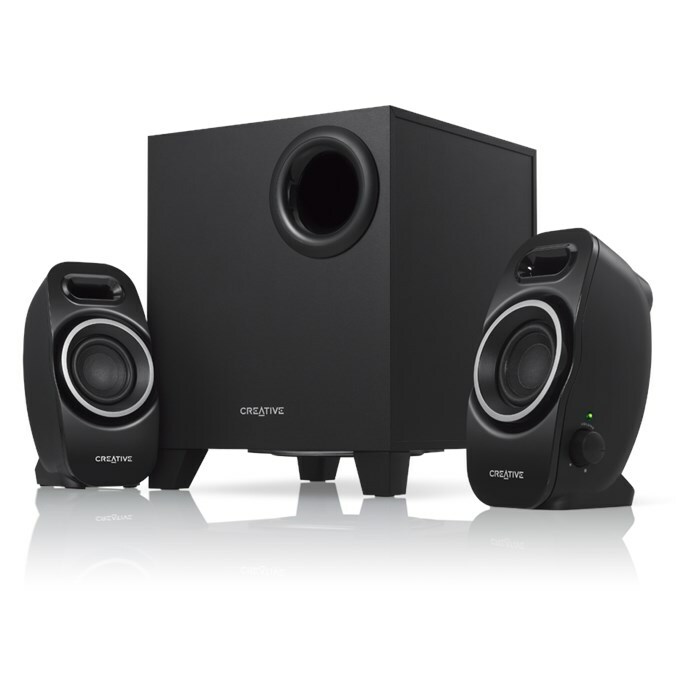 The Creative A250 2.1 Multimedia Speaker System is Creative’s budget speaker entry, and it offers an incredible value for the price. Integrated technology such as the image focusing plate and the dual slot enclosure gives the Creative A250 2.1 Multimedia Speaker System a rich sound that you’re sure to love.